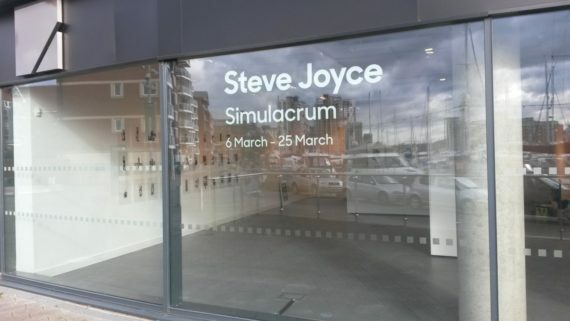 So the exhibition Simulacrum comes to an end. Last day is Saturday, tomorrow. 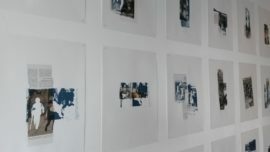 So a few more photographs of the installation. 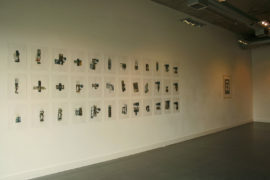 The residency continues, but next week will be take down the exhibition instead. So a bit of a delay to proceedings, but new ideas do await. I have been teaching printmaking at the Ipswich Institute for a term and much of it so far has been lino, so I tried out some of my ideas as well as making demo examples for the students, and I think that the new simulacrum may well have some pieces made by using other techniques rather than just screen printing. I got a portable printing press for the teaching which will do everything, as I have tested intaglio and relief printing methods on it, but it does have a size restriction. Ah well, got a residency for larger work. I am going back to theory, as well as work in the sketchbook for a couple of weeks and rethink things, and see what else I can develop. I have enjoyed working with the students the last couple of weeks so I will enjoy getting back after the big take down and sort out. Residency continues and Devices 2 print run is now complete. Also other pieces are either further developed or complete. Some examples are pictured here along with the layout print part finished for Devices 2, it is still wet so I will scan it next time. Reportage 4 or 5, oh dear I have lost count, is pictured as well. The landscape format is very different to the portrait format that I have been using mostly just lately. Devices 3 is planned but not started yet. Student interactions this week. 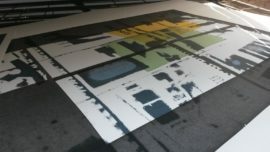 Zani was in again doing a multitude of pieces, including more large canvas print my for his exhibition in September. Sian came in with tutor Vicky to look at progress with crystals she has been making. All chemical stuff and over my head I am afraid, though I was intrigued when she came in taking about it last week, and now the results are amazing. Jen was I the print room again today. She went through her new prints with me discussing her ideas. Very strong I thought, and when questioned openly about issues and significations, she explained very clearly how the methods worked appropriately and said why. Nice interacting with students working at this level, made sense and; I learned something about printmaking too. I questioned how she combined certain techniques as I also wanted to know for myself. She used netting/fabrics pretty much as I had been preparing for my Wednesday evening print class, but Jen had found a fine weave which printed really well. I think I might widen my search for texture making materials. 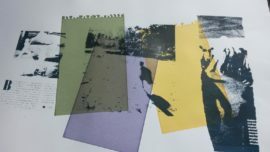 Also although I had been doing a lot of testing of print technique combinations, I had not realised that an etching could be re-soaked and reprinted with etching type methods. Thanks Jen for the tip. A very good day today. Back in the print room yesterday. Working on Devices 2 at the moment and also more Reportage pieces. I am working with a more varied colour range now on some of the pieces. So far it is working, as it brings a different aesthetic to the work, which will permeate these series and engage the viewer differently; by enticing them in, only to find out that sometimes all is not as it seems. 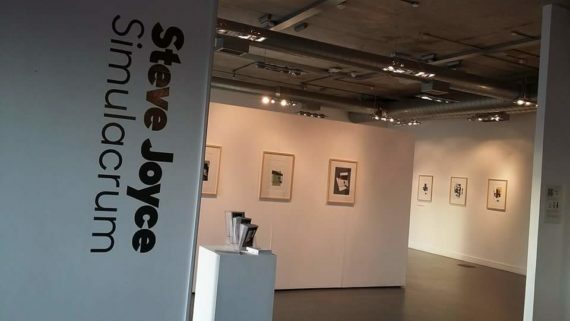 The exhibition is on for another couple of weeks so you better get down there before it ends, I will upload some installation shots later in the week. Students interactions. Zani was printing on large canvases this week and pondering on the consistency, we agreed that creating inconsistencies in the marks from the photo-screen worked well with the painted areas. Later I stopped by the installation room where Sian was setting up and photographing her work. She had made a sculpture, a head with a wig and recently cut branches. So we had an interesting discussion about it. We swapped notes on artists that may relate, her inspirations and I suggested looking at Billie Bond for how she used materials in portraits and Glenn Brown for similar subject matter but to look at different meanings, that got her curiosity going a bit further. Seems like she is going to look further into materials and surface. Sian was also thinking about the viewer a bit and thinking about positioning on the plinth and the how it looked from entering the room. This I thought was really interesting, she was thinking about the engagement of the viewer and how they relate to the work, as well as the meanings and symbolism, so when I turned it to face the wall she really considered how she might take it forward. Working well, Sian is, with a curiosity and an analytical approach developing well. An interesting end to my day, talking at length about somebody else’s ideas and finding out how their creative processing unfolds. Well the exhibition is up and launched. What a turn out, all went well on the launch night with visitors from near and far. 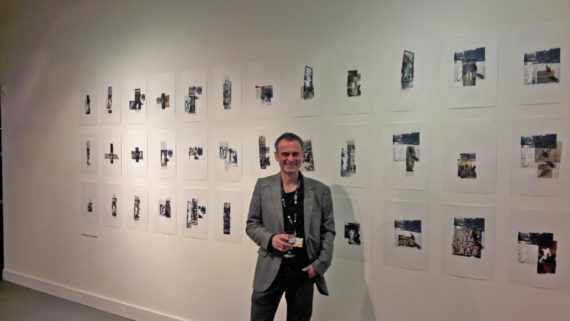 Started with some chat with students, then Simon was introduced to me and a tour and in depth chat about the work and ideas took up some time, as he was clearly interested and conversant with the references and ideas, before he made the speech and introduced me. Centre of attention, that’s what a solo show is all about, and at the centre, me, so that’s what it’s like. Funny, the residency is very much about sharing? So that’s ironic I guess. The thing about a one man show is that you can show a wide body of work all at the same time and really bring out those ideas. This is possible because of the reinforcement of ideas because of volume and also in the way they can be displayed and interrelate between the various ideas. 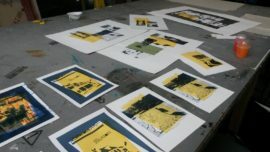 I have been back in the print room working on pieces that did not make the exhibition and talking to students. Zani was around again with interesting discussion, and interesting work. I got corrected as I previously wrote about Danny who he obviously now, is not. Ah well apologies. He could see the influences in my work, Sigma Pole, Rauschenberg Etc. I met with Paul Fisk for a radio interview as well, a busy week, he noticed the John Baldessari influence. Still waiting for the Mixcloud radio show archive upload from Saturday with my interview. Back to the print room tomorrow as many pieces of work still to finish. The exhibition is ready to go. Launch is on Thursday evening 9th March. Here is my statement from the catalogue. A few words from the artist. 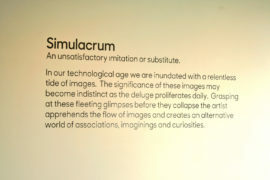 The simulacrum project starts from the premise that a copy might be an imitation or substitute, as its definition suggests. The idea originates from two sources, one a real experience and the other theoretical. In my own experience as time has progressed so has technology, and with it changes to how we encounter images. 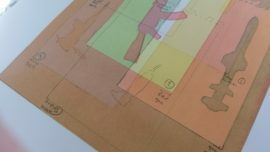 The ideas for this project were defined through research during studies for my masters degree, where a particular phrase, captured my imagination. This phrase relates to the writings of Roland Barthes, where the simulacrum is defined as a copy without an original. 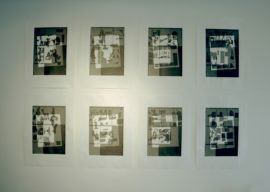 It was this question about reading images and how we relate to them, that changed the way that I thought about my work. While the work does not seek to illustrate the theory, it has provided a catalyst for developing the ideas and rethinking representation. 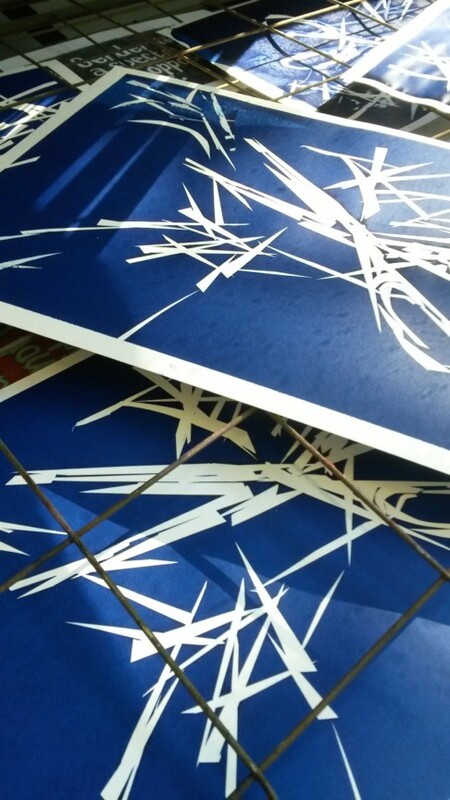 My practice for many years has centred on collage methods, along with painting and printmaking. But it was not until this point that they started to overlap.Collage is usually defined as found images reused to make another picture. As a process it is about recombining, and as a material it is similar to words in language, which pre-exist the expression before being combined. In this project both aspects are at play, as the original becomes a printed copy, while the found image clings on to the real world, and then they both float interchangeably.